Not many people are aware that Kempegowda was a chieftain of Yelahanka. (In his honour, the BBMP christened Yelahanka as the Kempegowda ward and started its ward-numbering system from there). The idea for a future town of Bengaluru was envisioned by him after a hamlet called HaLe-BengaLuru near present-day Kodigehalli. The rest of the story of Bangalore's development and construction of towers, etc. are quite well documented, so I won't delve into that. Yelahanka and the areas adjoining it, have been of significant importance since Kempegowda's times. Today, several establishments like the Air Force Station, Border Security Force, CRPF, Rail Wheel Factory, ITC, L&T, and many more institutions call Yelahanka their home. A little away from Yelahanka, is where the fun begins! You can see quaint lakes and simple villages, and you can see the all-encompassing metropolis stretching its arms out to consume it! Before this happens in the very near future(which , thanks to the Devanahalli Airport, is certain), my humble Honda Dio and my camera followed me to my random trips, and have found many interesting places, which I'd like to share in the coming few posts. The scene from a fast-growing suburb to a quaint little village suddenly changes upon crossing the railway track after the BMSIT campus, where I spotted a beautiful lake past Naganahalli. I found hoopoes, several red-watted lapwings, grey herons and pelicans. The mood of a riding across a country road in the rains, with a nice song playing, was, very peaceful and soothing! 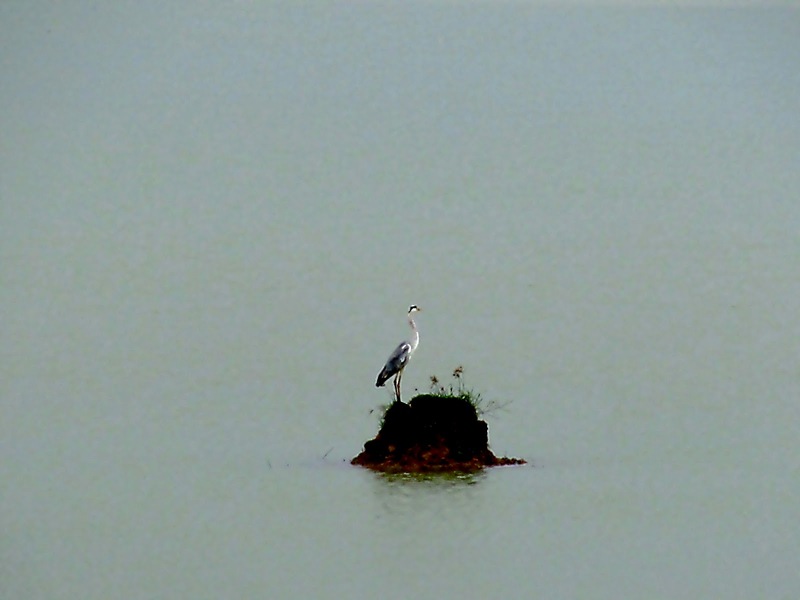 The poser - this lone handsome grey heron stood right in the middle of the lake for a good ten minutes! Ganganahalli lake, unlike the previous obscure one, is quite famous because of its proximity to NITTE Engineering College and the Yelahanka Air Strip. On any given day, one can spot many birds, planes, and 'birds' :P I happened to see all three of them :) The large canopy of ficus trees near the primary health centre adjoining the lake is home to many kingfishers, chirping mynas and the playful rose-ringed parakeets. Black-headed Ibis - their heads resemble the Devil's scythe! The grasslands and 'forests' beyond these lakes are very beautiful, which I hope to share soon. Jakkur is another old village that is now transforming into a booming suburb with apartments, international schools and what not! Several new layouts like Shivarama Karanth Nagar, and Hegdenagar, are already formed, and the lakes of Jakkur and Rachenahalli are being encroached as rapidly! Rachenahalli Lake, in the name of 'development' by the BDA, is now being made a park, with large parts of precious lake bed being used for this. Disappointed, I moved forward, hoping that the Jakkur Lake, atleast would be intact. The lake is a huge one, and sure enough, 'lakeview' apartment complexes are creeping up all over the lake's periphery! In the fast fading evening light, I could spot several egrets, mynas, pond herons and cormorants. What I really enjoyed, however, was watching a great cormorant spring up suddenly upon an unsuspecting fish, and have a quick meal! Shot within seconds - going, going, gone! There's much much more to see near Yelahanka, and hopefully I'll share them soon! P.S. - Due apologies for any bad photos. It was raining, and my focus was more on keeping my camera dry than composition! I've been hearing a lot about the birds, especially pelicans that have currently been sighted at Jakkur lake. I'd like to visit but have no idea how to get to the lake, or what would be the best part of the lake to sit and do some solid bird-watching. Any advice? Also, what's the best time according to you to go? Hi Ann. Jakkur Lake is 1-2km right of Bellary Road behind the Jakkur airfield. The ideal time to go is possibly just after the monsoon season, when the winter migratory birds begin to arrive.